Senator Bernie Sanders (I-VT) was instrumental in helping to direct the Senate version of a postal reform bill toward a bit of sanity. While the bill will ultimately satisfy no one fully (which is, of course, the basis for compromise) it does prevent some postal cutbacks for a period of time -- and it's infinitely preferable to the current proposed House bill, which would gut USPS outright. Now it remains to be seen if "the House always wins", as it were, but I'm hopeful that the Postal Service will be able to remain as relevant as it can to the communities of America for years to come (i.e., not downsized to extinction), thanks to some of the assurances and reforms instituted as parts of this bill. Now, let's look at a gorgeous P.O. from Vermont. It's not one of those rural offices on the chopping block which will be preserved for at least one more year thanks to the provisions introduced by Senator Sanders, but it's definitely worth a look. I have not seen a post office quite like Bellows Falls's. It's a gorgeous town located along the Connecticut River just across from New Hampshire, and I was able to learn about by speaking with a couple of residents who stopped to say hello (when they noticed my admiring their P.O.). So what makes the building unique? Well, it's a Treasury Department-financed WPA office from 1930, but unlike most such offices the focal point of this building does not lie at the center. The focal points lie at either side! The roof has Spanish-style tilework on top, and you've got blocks interspersed with brickwork that has well withstood the test of time. A lot of beautiful details went into the construction of the office, so let's take a closer look. Observe the details along the second-floor railing. 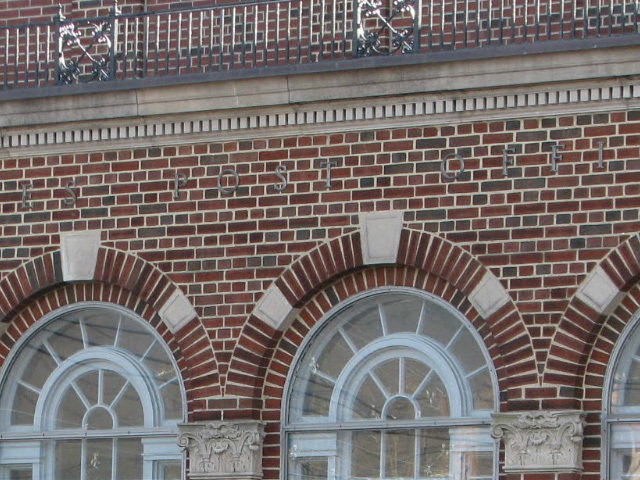 The five arched windows with Corinthian-headed brick columns. Note the subtle effect imbued by the two alternating row-styles of brickwork. A handicapped ramp was tastefully added along the side of the building. Second, they directed me to something strange -- the train was constructed under the town instead of at grade. As in, they dug a tunnel directly under the downtown. Look -- here it is! 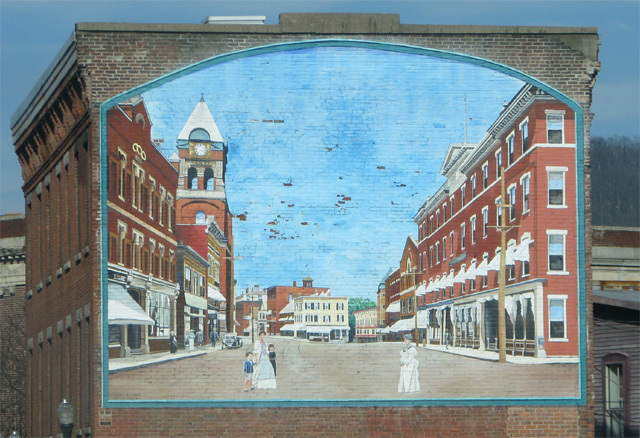 Here's the mural from above in full, presenting the town much as it looks to this day. 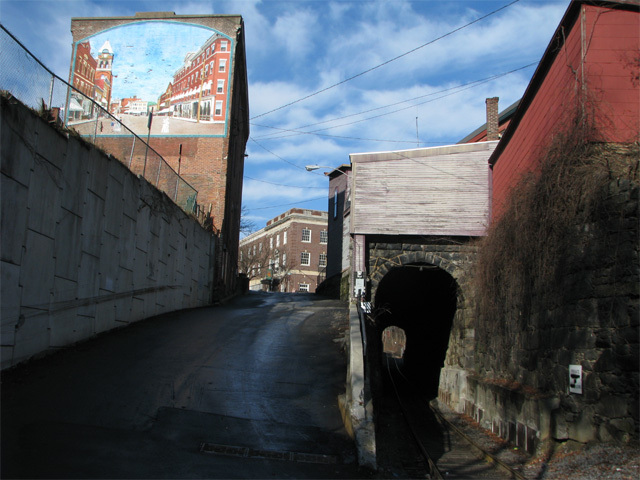 Finally, here's a view of the Bellows Falls P.O. in its setting. In the background are the hills of New Hampshire along the river. And yep -- they don't make 'em like they used to. LinkVermont.com has more information about some of the other unique aspects of this authentic New England town. 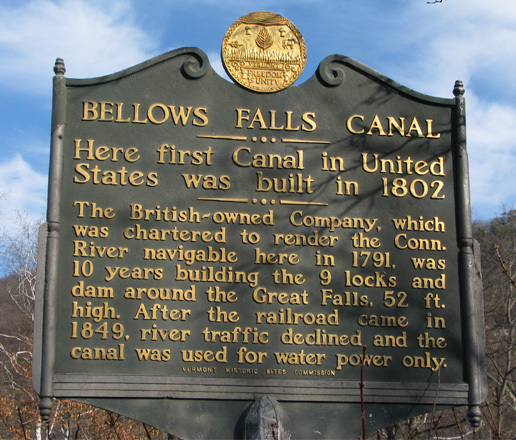 Looks like they used the same plans for Bellows Falls that they used for Mexia, Texas. I don't remember that the cornerstone was in the center at Mexia, though. There was a mix up in the plans for the post office. The blueprint for the Sante Fe, NM post office was sent to Bellows Falls, and Sante Fe got the blueprint for the Bellows Falls post office. They never bothered to switch them back. You can view the blueprint at the town office. Sante Fe has since built a new post office and I believe the old one may now be a library (not sure.) I did to find a photo of it and it looks somewhat similar to BF's library.